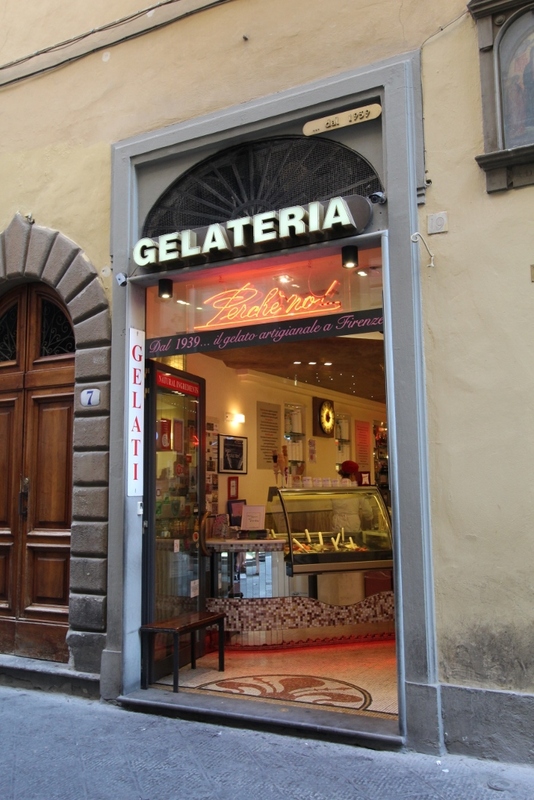 There have to be three great food experiences you’re looking for when you visit Italy: pizza, pasta and gelato. Standard, right? Easier said than done. Especially when you’re vegan. Don’t fret though, I ploughed on through and did the hard work required, by working my way through as many Florence-based veggie/vegan establishments as I could manage in a week of visiting this most beautiful city. After a wonderful morning strolling around the Bargello museum, the food adventures started, somewhat disappointingly, with a trip to Universo Vegano on Via Pietrapiana, 47 Rosso. I had been so excited at the prospect of visiting this place after looking on their website before even arriving in the country. It reminded me of the way all fast food restaurants advertise though – inevitably the products never come out looking quite like the pictures. Perhaps they were having an off-day, perhaps some products are better than others. It wasn’t terrible…. it was edible (just). A vegan universe, with an entirely vegan fast-food menu – how on earth could that disappoint, I hear you cry? With an anaemic looking pizza, scant on toppings and delivered to our table half cold. I opted for an artichoke and olive variety while my mum bravely ventured for a ‘vegan tuna’. The tuna was still semi-frozen when first delivered which was not a pleasant surprise. It improved somewhat by a return to the oven but was still a little too bizarre for my liking. A very mild reminiscence of tuna, but the pizza was also missing its advertised green olives. Universo Vegano offers a wide selection of fast-food options, most of which I cannot comment on but our first experience was enough to ensure we didn’t return at the risk of missing somewhere new. 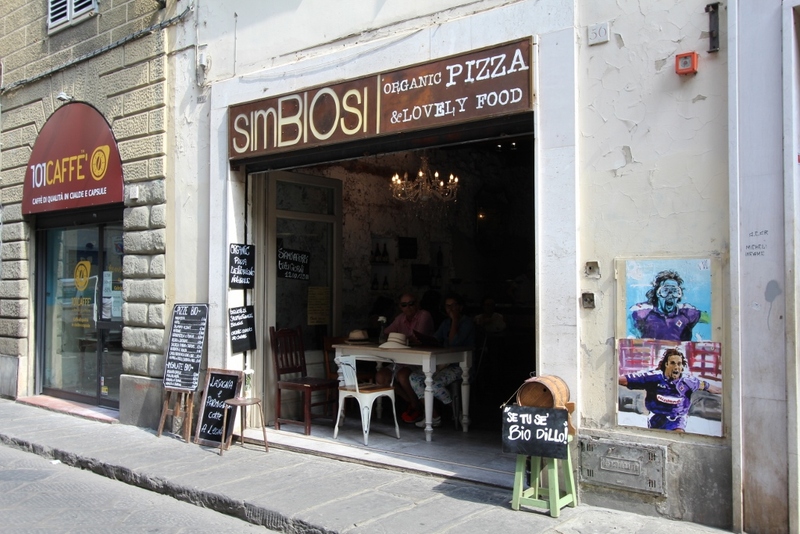 As well as pizzas, they offer burgers, risottos, wraps, ciabatta sandwiches and pasta dishes. Heavy on the mock meats and cheeses. The dessert cabinet was full of cakes with that strange, slightly artificial look about them – it wasn’t enough to tempt me, but there were some vegan pain au chocolat on the counter top which was a more interesting offer. Onwards and upwards I thought – what about some dessert at Gelateria Edoardo’s right on the Piazza del Duomo. Once I’d navigated my way through their somewhat bizarre gelato obtaining system which involved queuing, only to find once you reach the door that there is a ticket machine, which, being unaware of, you discover the entire queue behind you is in possession of a ticket with a number ahead of yours(!!) I got my hands on my first tub of vegan gelato. 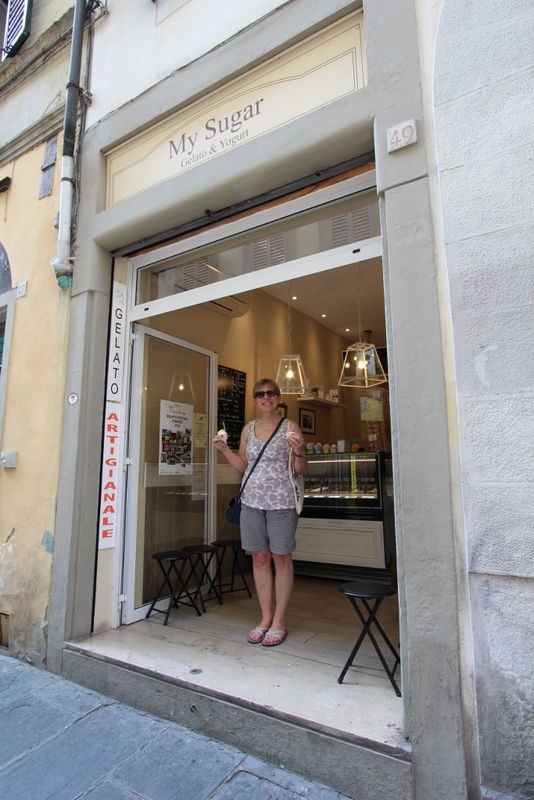 I was super excited – this was the first time ever I’d been able to find a pistachio gelato. My absolute all-time favourite icecream flavour; from the days of eating Indian kulfi. The partner to my pistachio was a pretty pink watermelon. I thought I was enjoying it when I started eating it, but as I worked my way through the tub I had to admit to myself that it was actually way too sweet for my taste. Day 2 saw us visit the Uffizi Art Gallery. With our minds full to the brim with sculpture and a heavy set of religious paintings, as is always the way with galleries (tiring work), hunger had set in. 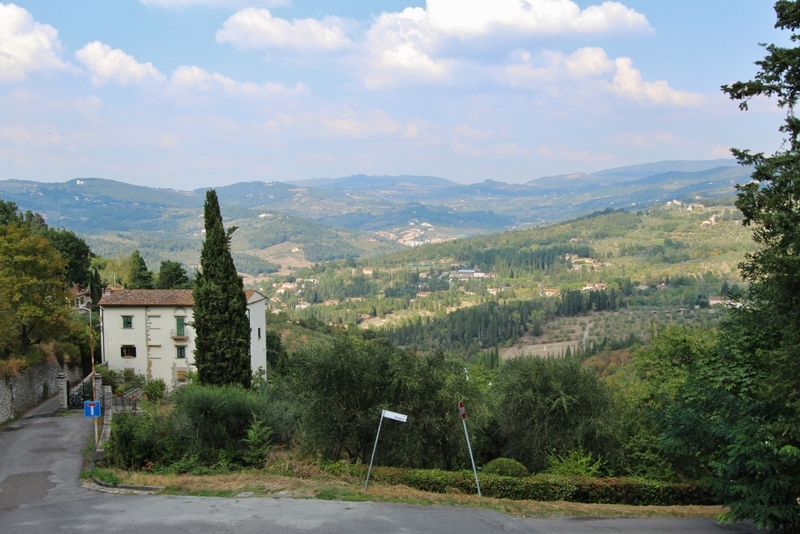 We ventured across the Arno, via the Ponte Vecchio of course, to the Boboli Gardens. Better for a bit of a snooze on the best attempt at grass you’re going to find than for the gardens themselves which were somewhat dry and not at their best. 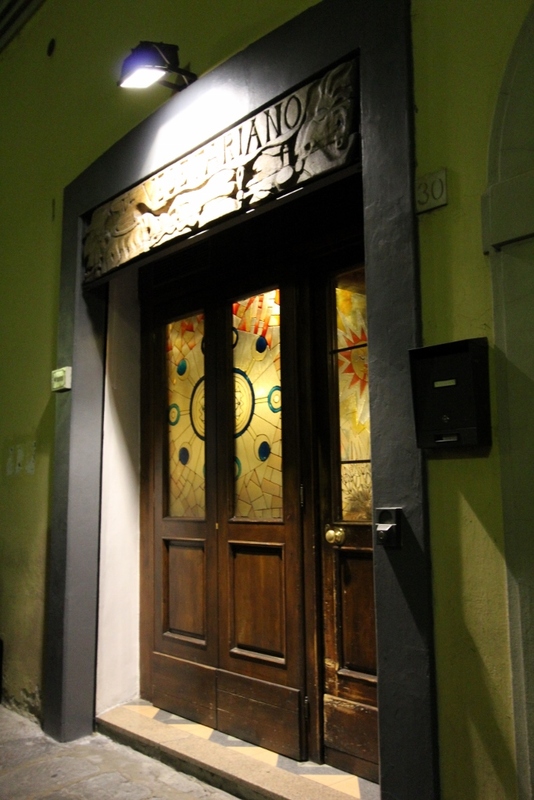 While on this side of the river we took the opportunity to seek out RAW on Via Sant’Agostino 11R. We chose 2 raw veggie wraps filled with a rainbow of veggies and served with a basil cream dipping sauce. Little on the pricey side at 7.50 Euros each, but if you’re into and appreciate raw food and the effort that goes into making these, you may consider it worth the investment. I certainly felt virtuous after eating it. My favourite part was my gelato for the day. Served in a beautiful bamboo boat, I chose a scoop of dark chocolate and a scoop of a banana-coconut concoction. The best bit was the presentation – topped with sprinkles of desiccated coconut and cocoa nibs. Again, the scoops were tiny for the price (in most gelaterias I found them to be pretty generous) but little pieces of heaven. Dinner at Dolce Vegan out of town, on Via S. Gallo, was a bit of a let-down. I was really looking forward to this place – it had some good reviews of its vegan pasta dishes, especially the ravioli. There was only ourselves and one other pair dining here the entire time we were there. On arrival we went up to the counter which had some very sad and sorry looking food out on display. Despite this, we pushed on (maybe we should have given up there and then! ), took our table and perused the menu. We both opted for the ravioli with a seitan ragu topping and shared a side of veg and a bottle of wine. The ravioli pasta had a somewhat strange consistency and was filled with an uninspiring, tasteless vegetable puree. Thank goodness for the ragu which made it slightly more passable, and, best of all, the Vegusto cheese. The veggies were plain steamed and again, uninspiring. The wine was pretty good, that’s about all I can say. Why, oh why, we opted for dessert is beyond me. It sounded better on the menu than it was but turned out to be one of the sorry looking ‘tortes’ I had spied in the counter. It didn’t look fresh, it was handed to me sloppily presented on the plate and again, the taste and texture was somewhat strange. A sort of claggy chocolate topping on a coconutty base. The worst thing about it was that it set us back about 40 euros. The most expensive meal of the trip for us, but sadly not the best. 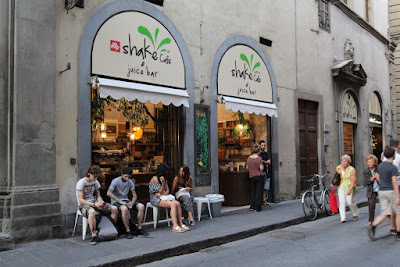 In the evening we just happened to pass a quirky looking juice-bar on Via Del Corso, Shake Café, that piqued my interest. A quick peruse of the menu and I spied a vegan reuben wrap so that was it, we were in. This was a great choice. It came warm which was a nice touch, filled with little chunks of tofu, lots of greens including kale and a tangy sauerkraut. 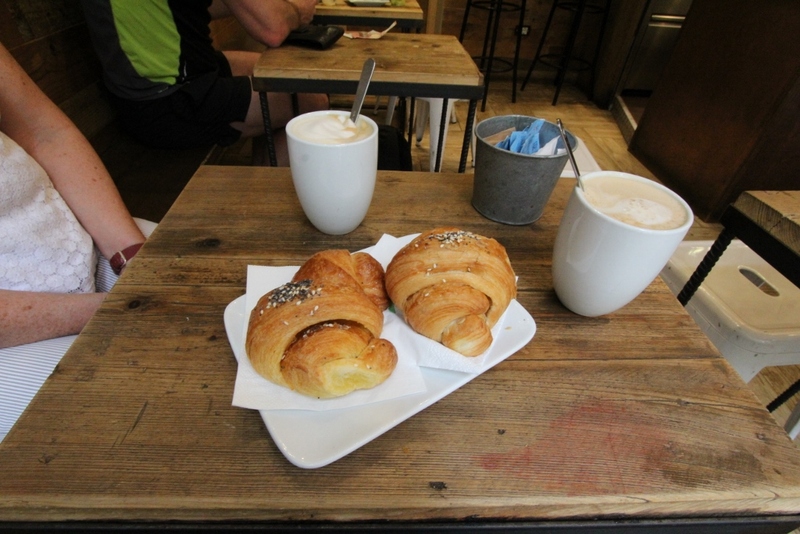 The juice menu was varied and looked good but I opted for a soya cappuccino and a vegan apricot croissant. This was also incredibly exciting. The pastry was buttery and melt-in-the-mouth, even if not as flaky as I remember croissants being. A little treat. 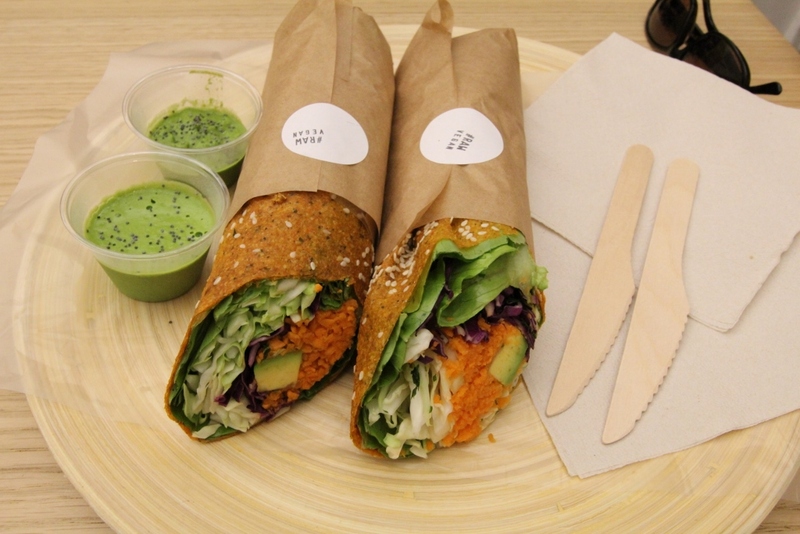 Shake Café isn’t totally vegetarian but its vegan options are good. 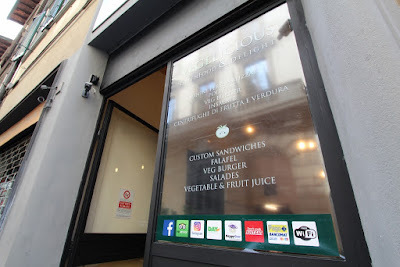 It also has a takeaway counter next door which serves more hot food including a vegan burger. 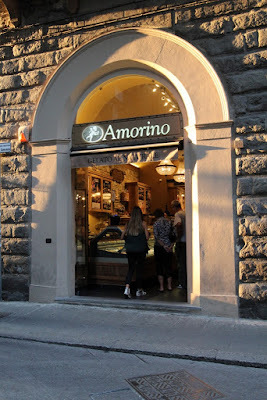 Just down the road from Shake Café still on Via Del Corso was the best gelateria I found during my time in Florence; Amorino. This was the best in my opinion because of its clearly labelled vegan options and offering of vegan pistachio sorbet. Unlike Edoardos, this was not overly sweet – just creamy and delicious. The first time I paired it with a banana sorbet which was a flavour match made in heaven and the most beautiful muted colours together. The second time I went for chocolate, mint-lime-basil and the pistachio again, but sadly, on tasting it, I just felt something was wrong. My mind wandered back to the counter-front and could picture the pistachio sorbet placed right next to the non-vegan pistachio gelato, but I couldn’t for the life of me remember which my server had scooped from. I never could prove it but I didn’t feel comfortable eating the rest and this did somewhat dampen my enthusiasm for Amorino. 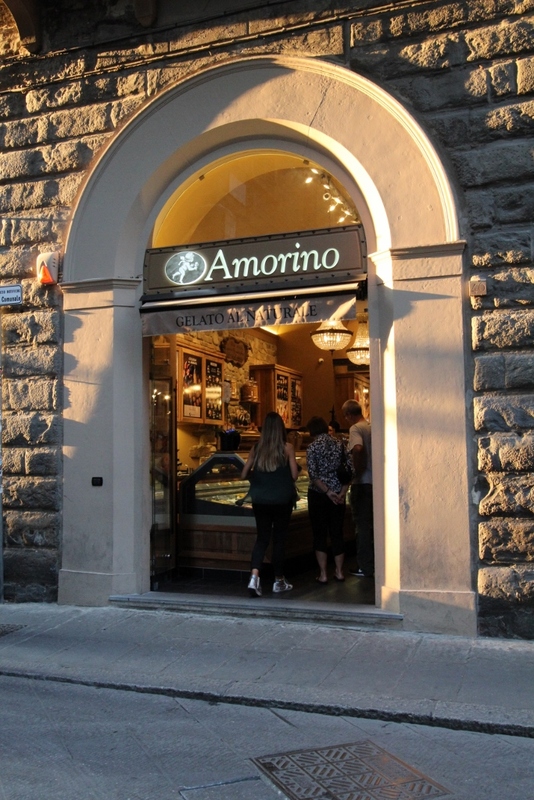 (NB: since returning to the UK a happy accident saw me discover a branch of Amorino in London, where the sorbet and gelato pistachio were segregated to my delight) Another really good gelateria we tried was Perche no! 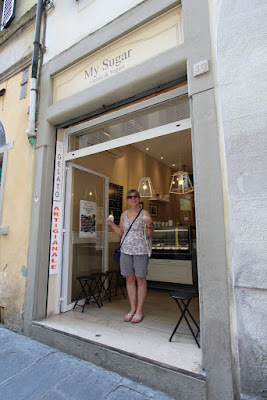 on Via Dei Tavolini which did seem to mostly keep its vegan flavours in a separate cabinet. Here I had vegan hazelnut soy-based gelato and grape sorbet. Again, creamy and delicious; #2 on the list, but it just wasn’t quite pistachio was it?! 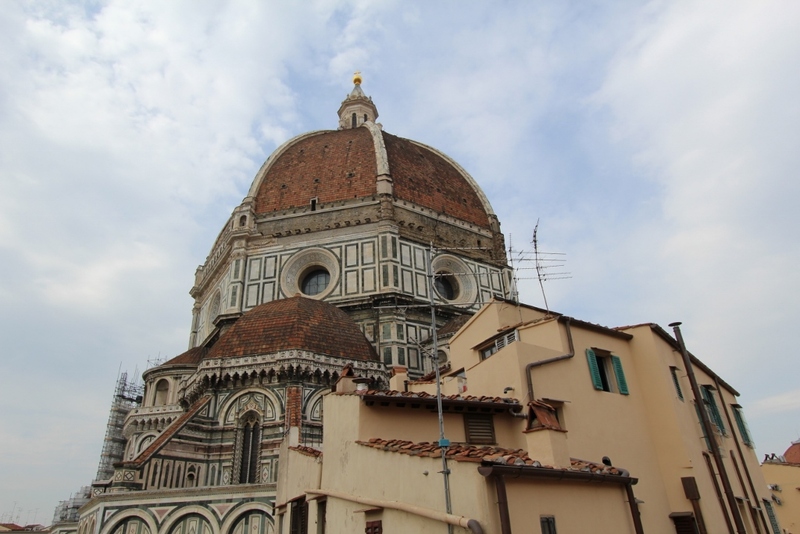 Day 4 was the touristy day with the combo-ticket of climbing the Duomo and Campanile, visiting the museum and the baptistery. Lunch was a quick and tasty on-the-go affair from Vegelicious on Via De' Pucci, eaten outside surrounded by beautiful architecture and sculptures. This is basically a falafel joint with a nice choice of breads. I had a traditional focaccia filled with crunchy falafel in a tahini dressing which was tasty and filling, there were Indian and Greek varieties available also. 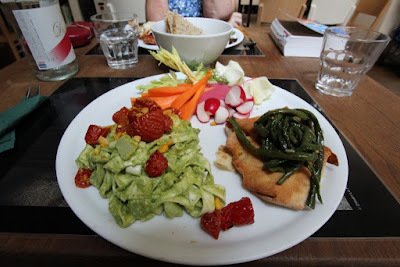 It was also a day we took a dining risk by eating at Il Vegetariano. My mum had been put off trying this place because of reviews mentioning the staff spoke little English and had a bit of an attitude towards non-Italian speaking guests. After a good shake, I convinced her it would be fine and off we went. A little out of the centre, Il Vegetariano looked quaint and rustic. Stepping inside was like walking into an Italian family home. Despite arriving early, as warned, the queue was already forming at the counter. A charming, Santa Claus-esque man was sat behind a little wooden counter scribbling down orders on a piece of paper. I selected a seitan stew on quinoa with a side salad and my mum went for a quiche. 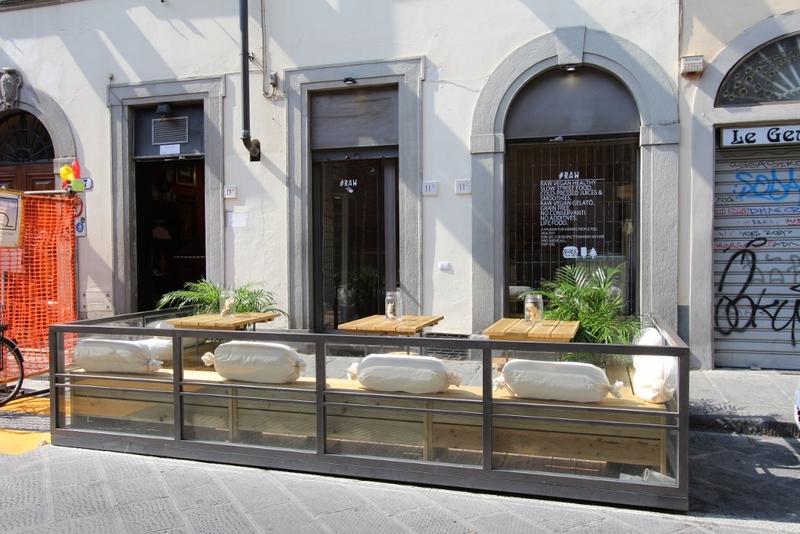 I placed our order in my best attempt at an Italian accent – hey, I got the point across and he didn’t seem to mind – and we picked a table outside in their little covered courtyard. It was all very homely although I did get attacked by invisible mosquitos! I found my food to be quite basic but comforting and my mum really enjoyed her quiche. I also made the mistake of putting olive oil and *soy sauce* on my salad – I had mistaken it for balsamic but I think this was totally reasonable as there was nothing oriental on the menu for a soy sauce accompaniment. I went back for dessert which was a peach and apricot crumble cake and totally delicious. 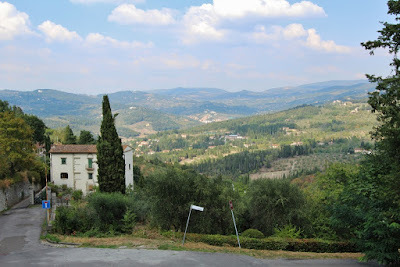 Sunday on our fifth day in Florence saw us meandering along the backstreets, somewhat hangry as the restaurant we’d gone to was closed, when we stumbled unexpectedly across an organic pizzeria on Via de' Ginori. The restaurant doors opened right out onto the street and we could see inside to an authentic wood burning pizza oven. There was actually a vegan pizza listed on the menu, with courgettes and a vegan rice-based mozzarella but I opted for the vegetarian with no cheese instead. Maybe that first pizza had put me off! It was a pretty good pizza, but as I somewhat shyly whispered – I just don’t get it, Pizza Express is just as good! 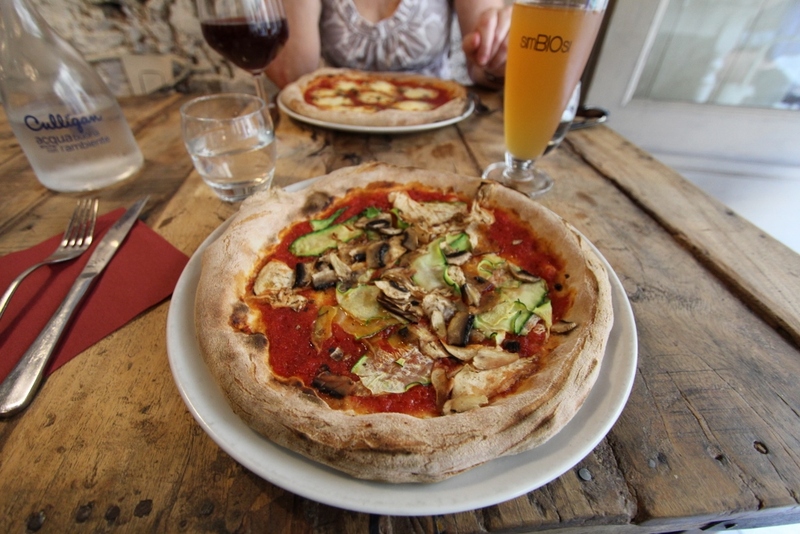 It definitely had an organic and wholesome healthy taste to it; the toppings were too sparing and sliced too thinly for my liking – pizzerias, take note: be more generous with the veggies on a cheese-less pizza! Still, friendly, helpful service and a delicious apple juice to go with my pretty good pizza made this a pretty good vegan option in Florence. Right opposite was My Sugar, apparently award-winning, gelato. Again, a little green leaf indicated the dairy free options and my strawberry and grapefruit, whilst not the most adventurous of flavours, were deliciously creamy. Another gelato-based success. 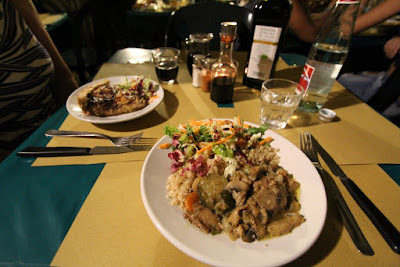 Saving the best until last, our final meal out in Italy was back down near the Arno. I wasn’t sure whether it was worth making the trek but it was totally, totally worth it. 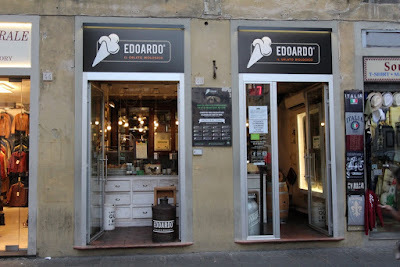 I am so glad I didn’t miss this vegan offering whilst in Florence. Libreria Brac on Via dei Vagellai was a tad hard to find, but an absolute delight. The décor was unusual, we were sitting in what felt like a tasteful library / accomplished literary genius’ home! The only slightly negative was that the service was a little ‘off’ at times although the waitress wasted no time in explaining this away in that she was having a really bad day! We were served plain bread with our drinks and the family next to us, served at the same time, requested olive oil and balsamic vinegar. The waitress brought this for them but didn’t think to bring for us too. When I requested the same, I only received the oil. This was all forgiven and forgotten when the mains arrived. The whole menu sounded delicious, I had difficulty choosing, but for the bargain of 12 euros you could have a piatto unico with a choice of one salad option, one pasta/rice option and one traditional stuffed flatbread (pane carasau) option. Generous portion sizes and so, so tasty. Really fresh, flavourful, exciting combinations on one plate. When it arrived, it looked pretty on the plate but a little simple – I was not expecting the flavours to pack such a punch. It absolutely blew me away and the fresh pasta was the best I think I’ve ever had, in Italy or otherwise. So a somewhat average pizza experience, lots and lots of really decent gelato options and the best pasta of my life. I can live with that. Italy, Florence, it was an absolute pleasure.